You may think your canine would love to gnaw on a turkey leg, but the truth is a bone could be extremely dangerous to your pup. It can splinter and cause perforation of the intestine; also, it can get lodged in the mouth, throat, or gastrointestinal tract. Instead: All white meat turkey can be a wonderful treat in moderation. Just make sure to remove all of the bones and skin. Even a small amount of raisins can be extremely problematic to your dog. They contain unknown toxins that can cause kidney damage. Some cranberry sauce and stuffing recipes call for raisins, so be on alert when checking these dishes. Instead: Some pet foods contain cranberry, so if your pet is already used to it, plain cranberries are a better option. Many cookies contain chocolate and/or nuts, which are no-no’s. It’s probably no shock that chocolate is a danger to your pet. A potential lethal dose of chocolate for a 16lb. animal is only 2oz. of baker’s chocolate. The main nut offender is macadamia nuts, which contain toxins. As few as 6 macadamia nuts can have a serious effect on your pet impacting their digestive tract, nervous system, and skeletal muscles. Instead: We recommend sticking with doggie “cookies”, whichever brand they are used to. Onions are predominantly problematic for kitties, although good to avoid with dogs as well. Common holiday dishes containing onion are stuffing, gravy, and green bean casserole. 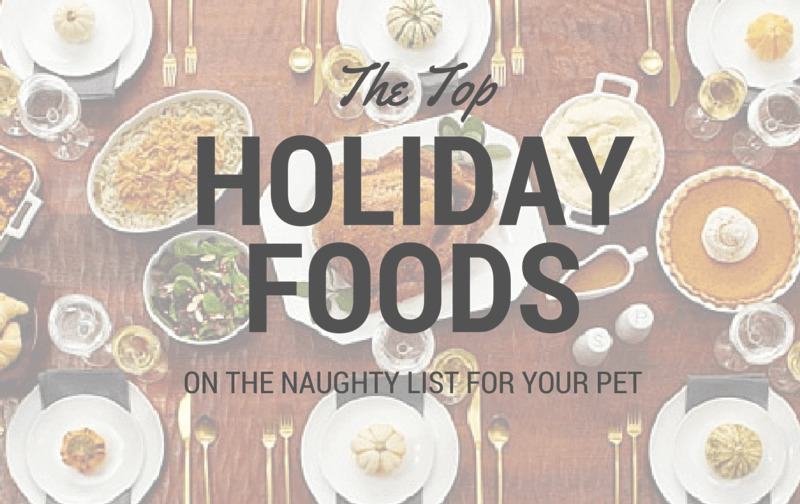 Beyond the use of onion, these dishes are far too rich for your pet to handle. Instead: Your dog can enjoy plain veggies if they are used to them in their diet. However; avoid corn on the cob, which can break off and create blockage similar to ingesting a bone. If you’re looking for a healthy reward your dog will absolutely love you for; take them for a long walk! It will also give you a chance to walk off all of those extra holiday calories. Any sudden change in diet can cause gastrointestinal upset in your pet. If your pet is vomiting, has diarrhea, or is showing any abnormal behavior, we recommend calling your veterinarian immediately. If you believe that they have ingested something toxic, you may also contact the ASPCA Animal Poison Control.